This new route is for candidates who willingly give up their lives for others. There is now a fourth pathway to achieving sainthood within the Catholic Church. 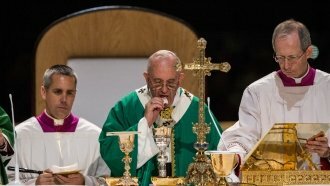 In a letter issued Tuesday, Pope Francis announced the new way would recognize people who willingly give up their lives for others. Up until now, the only routes to sainthood were dying for the faith; living a life of heroic, Christian values; or having a devout reputation. Under this new pathway, the Vatican's newspaper says a person who died after knowingly caring for patients sick with the plague could be considered. The Vatican provided some regimented criteria for this new fourth path. First, the person must freely and voluntarily offer up their life in the face of certain death. There must be a connection between the act of charity and the premature death. The individual must have lived a life filled with Christian values and had a holy reputation. And finally, there needs to be a miracle attributed to the person sacrificing their life. The miracle requirement is pretty standard for all candidates for sainthood. Though, those who were martyred don't need one to be beatified, which is one of the steps toward sainthood. Pope Francis has canonized a total of 850 saints during his five years as the head of the Catholic Church.